Around the world, Michelin innovates to contribute in a sustainable way to mobility: from cars and bicycles to footwear and space shuttles. The Michelin Lifestyle business owns more than 2000 products, created by more than 50 licensees globally. 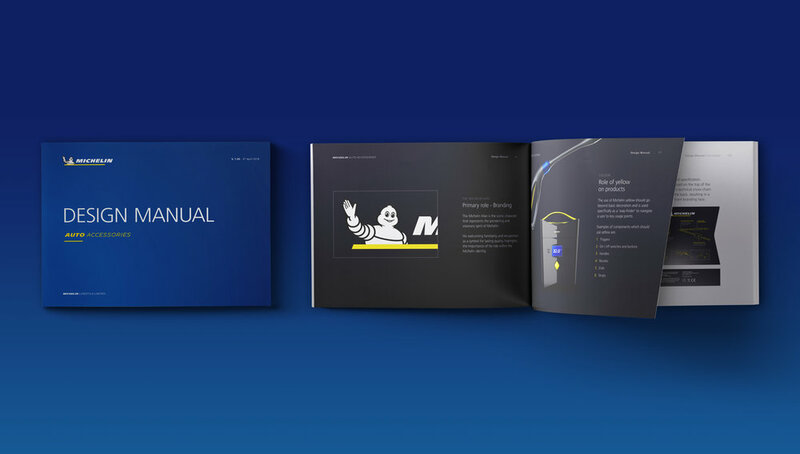 Michelin has partnered with Echo to create design principles and brand guidelines that unite the brand and products under a single design system. Echo visually translated the Michelin mission of ‘A better way forward’ into ‘the chevron’, a visual device that reflects Michelin’s progressive vision and unrelenting drive to develop better solutions that keep people moving. The chevron device creates an ownable, yet flexible focal point on pack and a physical equity around which new product aesthetics can be built. Echo then created a living and breathing toolkit that demonstrates to licensee partners how the design guidelines can work in real world situations. The new design system gives a considered place to Michelin’s iconic Bibendum, meaning he always has a role communicating important information on pack. The new design system works to mutually empower both the Michelin brand and the licensees. Licensees are able to utilise the iconic Michelin brand in the best possible way, while the Michelin lifestyle team can feel confident that there will be cohesion through a design that does justice to Michelin’s iconic status. Andrew Capper, Creative Director at Echo comments: “We set up Echo to tackle exactly this kind of challenge: delivering brand visions that are both powerful and cohesive at every touch-point, so the result is one seamless experience no matter where and when you interface with the brand. Even for brands with as much equity as Michelin, it’s the only way to approach brand and product in today’s world. The new design is currently being adopted by licensees and receiving positive endorsement from retail partners globally.